Justin A. Harriman is a Civil Litigation Attorney at Altman & Altman, LLP. Harriman received his Bachelor of Sciences Degree from Boston College as well as his Juris Doctorate from Boston College Law School, making him the firm's Double Eagle. 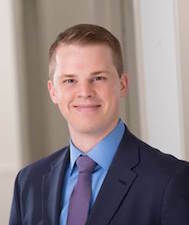 Harriman began his career at Altman & Altman, LLP as a Summer Associate in 2012 and is licensed to practice law in the Commonwealth of Massachusetts. Harriman's meandering career path before joining the firm allows him to relate to a wide range of clients. From designing and building homes ranging from an igloo in Alaska to a home featured on Extreme Makeover Home Edition, to managing the busiest Chipotle in New England, to working as a private contractor with Secret security clearance for the United States Air Force, there is not much he has not seen or cannot do. Harriman's practice focuses on the handling of civil matters. He has a wide range of experience handling civil litigation matters including automobile accidents, MBTA accidents, slip and fall accidents, premises liability, and work injuries. Despite his baby face, Harriman is quickly becoming known as a force to be reckoned with and a no-nonsense advocate for his clients. Harriman is available around the clock and is always willing to answer questions from clients. Outside of the office Harriman is an avid Boston sports fan and likes to think that his arrival in Boston in 2004 heralded a new championship era for Boston sports. He himself is a three season softball player and a consummate bowler. In 2015 he read 77 books. He enjoys going to the movies, a nice dinner out, or a night in playing videogames with friends.